Travel Medical Insurance is becoming more and more popular and necessary for good reason these days. I had been hearing enough stories of people having severe medical issues only to survive and then experience catastrophic financial crisis because of the medical expenses in a foreign country and or the costs of air evacuation (EVAC) and or the continued medical costs once in their home country. I went looking for my own needs and was introduced to the International Medical Group Insurance. I realized I too had been playing a form of Russian roulette that so far I had no need to think I wouldn’t continue to win by not having any accidents. Well that almost changed for me last year when I had an airplane accident in Baja where I was not hurt seriously but was taken to the hospital with a very sore neck and shoulder that could have been much worse. When I left the military hospital I asked who I owed and they said no one because it was the Navy hospital and I’m a Mexican citizen. Had it happened in the U.S. I would not like to think what the costs for just the ambulance and or emergency services would have been. I then realized with the motivation of a more recent story from a Bajainsider.com reader that has shared their horrible experience of surviving a near death surfing accident to be almost financially destroyed because of lack of insurance and the cost of the emergency services. These people ended up with 4 ambulance rides from hospital to hospital only to finally EVAC (Air ambulance) to Southern California all by using their credit cards up to their limits! I won’t go into all the details here as to why but some of the hospitals along the way and the air ambulance services has charged them much more than originally quoted and there seems to be some very fishy billing that is still being resolved. The problem is without Travel Medical insurance they had no one safeguarding them from this type of financial burden. A Travel Health protection plan protecting you from accident & illness eliminates the uncertainty of a financial disaster and puts someone on your side to be sure you get the best medical assistance without going bankrupt. All of us get older, unless someone is holding out on that infamous fountain and as we do, we become more brittle, less durable and yet many of us try to keep shortening our bucket list…eventually shits going to happen. Maybe you say you are not that adventurous type but I just heard the story of an older person 55 haha, that just finished a canopy ride that day then later tripped at the hotel upon arrival and severely broke their leg and hip, bad enough they needed air EVAC out of rural Costa Rica. I’m sure that wasn’t cheap but they had Travel Medical Insurance and only had to pay the deductible. IMG with over 20 years experience in international travel medical insurance provides assistance worldwide; working in multiple time zones, languages and currencies is the norm for them. With PPO providers all over the U.S. and International Provider Access for the rest of the world, with an international, multilingual staff they can help you get the medical attention you need. IMG say they back up what they promise “Coverage without boundaries that provides Global Peace of Mind”. The question now is not whether you need to have Travel Medical Insurance but with who and what plan is best for you. International Medical Group offers either a single trip short term insurance policy or for those that regularly travel a multi trip Annual plan if your trip durations out of your home country are less than 45 days at one time, perfect for the frequent traveler. These plans do include Air EVAC which can be of real assistance if you travel in rural areas and or 3rd world countries where you don’t speak the language and may not receive the quality you deserve. West Coast Insurance Services offers protection for Travel Health Insurance and would be glad to answer any questions you may have concerning what policy is the best for you and what coverage you will receive based on your travel patterns out of your home country. 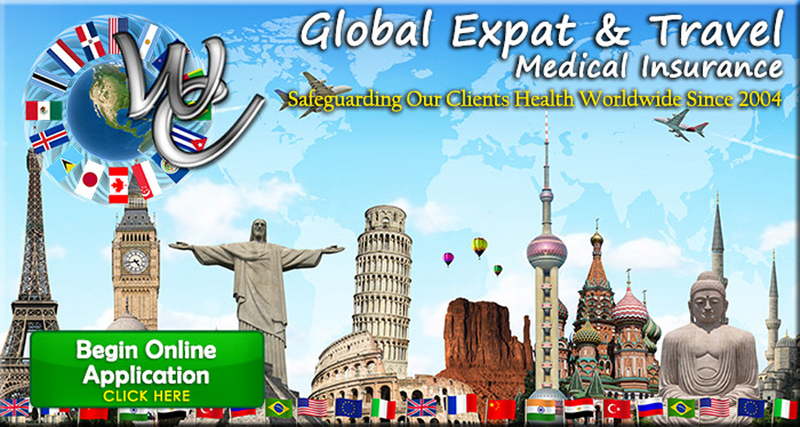 Flexible, Short-Term, Worldwide Travel Medical Insurance for citizens traveling or working outside their home country. No Restrictions on Citizenship. Short-term travel medical insurance for individuals and families traveling outside their home country. You have enough to worry about when you're traveling. Don't let your medical coverage be an uncertainty. IMG has developed two Patriot Travel Medical Insurance plans that offer a complete package of international benefits available 24 hours a day. Patriot International® provides coverage for U.S. citizens traveling outside the U.S. with coverage for brief returns to the U.S., while Patriot America® provides coverage for non-U.S. citizens traveling outside their home country. Both plans are available for a minimum of 5 days up to a maximum of two years, in accordance with the terms of the Certificate of Insurance.